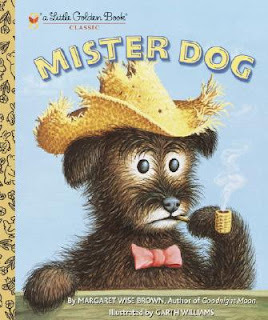 On a recent trip to Barnes & Noble, Tony and I picked up a The Little Golden Book Collection of Animal Tales for Angus because it contained Tony's favorite childhood story, Mister Dog by Margaret Wise Brown. At first, both Angus and I were pretty uninterested in the story. But, in the past few days it has become a must read for both of us. Angus smiles almost the whole way through. It is a strange little rambling tale of an old dog named Crispin's Crispian who lives alone in a two story dog house and belongs to only himself until he finds a little boy who also belongs to only himself. The two decide to live together and the whole story is fairly uneventful. But there is something to the simplicity. A calmness and a kind of comfortable that can't be explained. I think I may have pinpointed the reason why we all love it so much. There is this one passage that explains the way Crispin's Crispian lives his life that rings true for we Browns. We are taking the word conservative back from those who dwell in the far right of society and putting it back where it belongs.....as a way to describe a slightly OCD need for a comfortable routine and the peace of mind that knowing all is well can bring to those inclined to worry.